We specialize in ACLS courses, CPR training courses, PALS Courses and much more! Sign up for classes today! 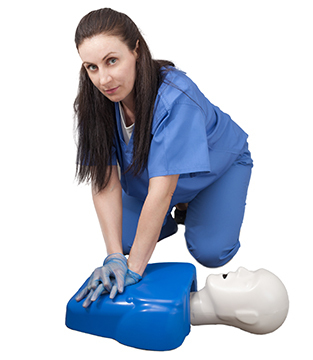 CPR Training Courses for Contra Costa County, Concord Ca, Brentwood Ca, San Ramon Ca. CPR Training Center was established as an American Heart Association Training Center in 1988, AHA ID CA04725. Dominic Ciotola, Battalion Chief with Contra Costa County Fire Protection District and Regional Faculty for American Heart Association, purchased the company in 1994. Dominic and CPR Training Center staff have been providing superior customer service and quality training to all clients for over 25 years. Areas or service: CPR Training Center services the entire East Bay, Contra Costa County, including San Ramon, Brentwood and surrounding areas. The office is located at 2190 Meridian Park Blvd Suite J, Concord. ACLS, PALS and CPR courses can be scheduled at our office or in a group setting at your location. Group Courses: CPR Training Center specializes in Healthcare Provider courses including American Heart Association BLS Healthcare Provider, Advanced Cardiac Life Support and Pediatric Advanced Life Support. Neonatal Resuscitation courses are also available for groups or individuals. Surgery Centers and Outpatient Clinics are encouraged to take advantage of our onsite training so that we can provide helpful tips for ACLS, PALS and BLS outside of the hospital setting. Our company will provide onsite training for a group of six or more. Times and scheduling is flexible, we ask that you contact the office for group pricing. OSHA Compliance programs are available including Heartsaver CPR, Heartsaver CPR/AED and Heartsaver First Aid/CPR/AED. To schedule your safety training seminars we ask that you contact our Concord Office 925-934-6223. Instructors: CPR Training Center staff will make participants feel comfortable during all courses providing a low stress learning environment. Instructor staff includes Physicians, Nurses, Paramedics, and Firefighters that are all currently practicing emergency providers. The experience that they provide will assist in presenting the American Heart Association Science. Student Discounts: CPR Training Center will provide student discounts for those attending Nursing School at Los Medanos College, Cal State Hayward, Samuel Merritt College, Napa Valley College, San Francisco State and Dominican College. Please call the office to inquire about other schools not listed. Discounts apply to all ACLS, PALS and NRP courses. Hospital Employee Discounts: CPR Training Center will provide discounts to current employees of John Muir Hospital Walnut Creek and John Muir Hospital Concord campus, Kaiser Hospital, Alta Bates and Contra Costa Regional Medical Center. Discounts apply to all advanced courses including PALS and ACLS courses. American Heart Association Cards: American Heart Association cards will be provided upon successful completion of the course. Other training locations in the Bay Area may delay issuing the card which can be inconvenient. CPR training Center does not cancel courses.